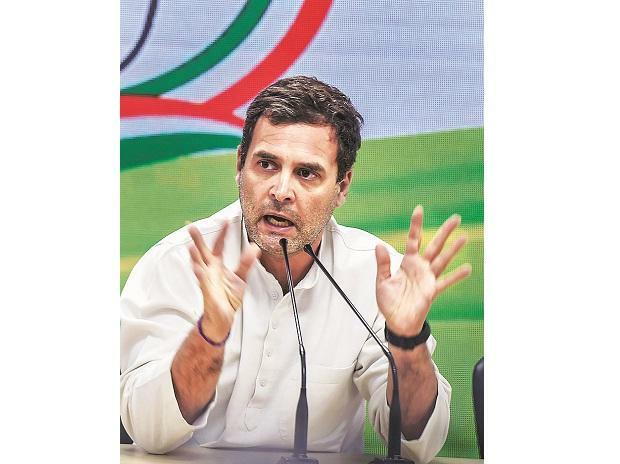 Congress President Rahul Gandhi said his party, if it were to form the government at the Centre after the Lok Sabha elections, would ensure a minimum income of Rs 6,000 per month to 20 per cent poorest of poor households, or 250 million people. While the Narendra Modi government had promised to Rs 6,000 per year to poor farmers, the Congress has promised a matching amount to all poor, particularly the landless. The party, however, scrapped its earlier proposal that envisaged topping up the gap between a poor household’s income to bring it to Rs 12,000. It has now promised a flat Rs 6,000 per month allowance, or Rs 72,000 per year, if a family’s income is below Rs 12,000. Gandhi said a committee of party leaders, which included Manmohan Singh and P Chidambaram, had calculated that the basic living income each family needs to survive is Rs 12,000. Calling the scheme “last attack on poverty”, Gandhi said the income would be transferred to the bank accounts of women in each family. The scheme would cover rural as well urban poor. The implementation will be based on pilot projects the party plans to take up in the first two years of its government, and the scheme is likely to be launched in the third year. According to party sources, NYAY, or Nyuntam Aay Yojana, could subsume some of the existing schemes, particularly old age pensions. However, they denied any plans to scrap its rural employment guarantee scheme. The party said the fiscal burden at Rs 3.5 trillion per annum would be around 1.2 per cent of the GDP of India. Praveen Chakravarti, data analytics chief of the party, said the effort was to “remonetise” the economy, which would boost demand and growth. “I promise that there will be justice for the poor. This is a historic scheme which has not happened anywhere in the world. It is an extremely powerful, ground-breaking and well-thought through idea. We have consulted many economists on the scheme,” Gandhi said at a press conference. “It will be a fiscally prudent scheme,” he said. Gandhi said if Modi can give money to the rich people in the country, then Congress can give the poor this money. “We have consulted economists, this is doable, and we will adhere to fiscal discipline,” former finance minister P Chidambaram. Gandhi announced the details of the scheme after a meeting of the Congress Working Committee that approved the party’s election manifesto for the 2019 Lok Sabha polls. The manifesto is likely to be unveiled later this week. The Congress president had initially made unveiled at a public rally in Raipur in Chhattisgarh on January 28. 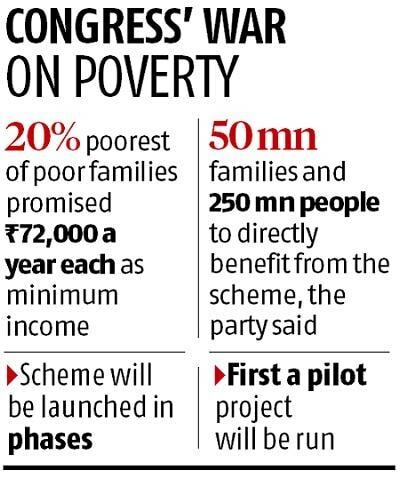 The Congress plans to implement the scheme in phases after coming to power. The party has already promised a farm loan waiver scheme, but sources said that has already been implemented in most states where the Congress is in power. Congress leaders said NYAY gets its inspiration from Mahatma Gandhi’s vision of helping the last man and woman. The promise has echoes of the 1971 election campaign of Indira Gandhi-led Congress party of ‘Garibi Hatao’, or remove poverty. Party sources said it is inspired from Brazil’s Bolsa Familia programme, but also the resolution that Subhas Chandra Bose piloted in the Karachi conference of the Congress in 1931. The resolution had promised “protection against the economic consequences of old age, sickness and unemployment”.